UPDATE: The contest result is out. A couple of weeks ago a probe message was sent to a few places questioning whether there would be enough interest on a development contest involving Go QML applications. Since the result was quite positive, we’re moving the idea forward! This blog post provides further information on how to participate. If you have any other questions not covered here, or want technical help with your application, please get in touch via the mailing list or twitter. Participating applications must be developed in Go with a graphic interface that leverages the qml package, and must be made publicly available under an Open Source license approved by the OSI. The application may be developed on Linux, Mac OS, or Windows. We realize the time is short, so please submit even if you haven’t managed to get everything you wanted in place. All submissions should be made before the daylight of the Monday on April 21st. If necessary for judging, a screencast may be explicitly requested, and must be provided before the daylight of Wednesday 23rd. 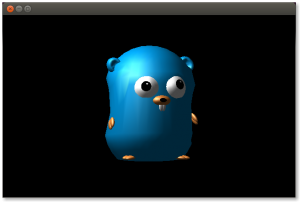 Judging will be done by well known developers from the Go community, and will take place during GopherCon. The result will be announced during the conference as well, but the winner doesn’t have to be in the conference to participate in the contest. The best places to start are the package documentation and the mailing list. This entry was posted in Conference, Go, Project. Bookmark the permalink. Are Ubuntu touch qml apps powered by Go eligible? I mean can developers use Ubuntu’s QML components? Yes, using stock components, whether from Ubuntu or not, is fine.